March traditionally goes out like a lamb. I don’t even want to say what the month went out like this year, but it had best not go out that way again! Now that signs of migration and regrowth are popping up daily in the Northern Hemisphere, the time has come to shake off that cabin fever and indulge in some wilderness therapy. Corey and I are both planning to get out there this weekend. How about you? Where will you be this weekend and will you be birding? Share your plans in the comments below. 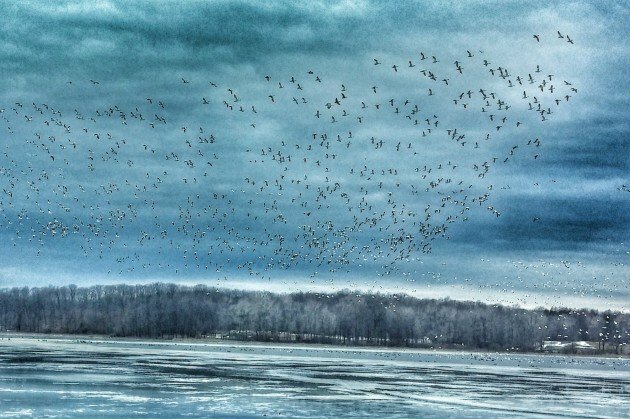 I’m going to Freezeout Lake with some friends to check out the waterfowl situation. Terrific shot! Now that’s a flock of birds! Most of my birding takes place in my backyard. At any given time we have between 10 and 20 feeders up, which attract lots of birds. It was a very harsh winter (southern Manitoba, Canada) so exciting sightings were slim. However, with the warm weather I’m hoping to see some migrating birds. There it is, on a tree!